Catch up with alumni you know, and network with those you don't, given Baltimore Corps' ever-expanding network of Allies, Awardees, Fellows, and more. Be the first to hear from Fagan about the next 5 years, and beyond -- and your critical role. Hear from a panel of alumni -- both Fellows and Awardees -- and help cast a vision for an engaged Baltimore Corps Alumni Network. 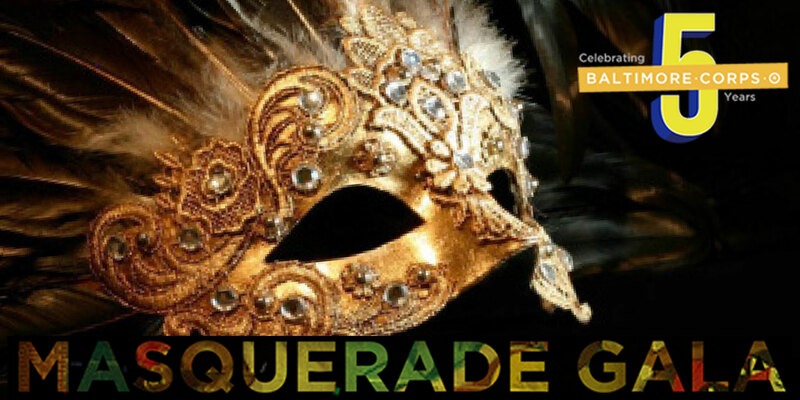 I couldn't be more excited as our week-long celebration of Baltimore Corps' 5th Anniversary is nearly upon us. Even as that planning has been underway, we welcomed our newest cohort of Elevation Awardees and held our first matching fair between potential Public Allies and Partner Organizations. With the frenetic activity of the present, I very much welcome the opportunity this anniversary affords, not only to reflect on the many success stories of Baltimore Corps over the past five years, but the incredible future that lies ahead. But the "activity," "success stories," and "future" all indicate what is truly at the heart of Baltimore Corps, and that is YOU -- the PEOPLE that make up this growing network dedicated to accelerating social innovation in Baltimore and advancing a citywide agenda for equity and racial justice. There's so much to say about where we have come from, and where we are going together, but I look forward to being able to express that in person with you in the coming week. To that end, I'll just highlight a couple of items and let you peruse the week's public events listed below. If you are Baltimore Corps Alumni (Elevation Awards, Fellowship, Place for Purpose, Public Allies), I very much look forward to catching up with you at Wednesday's Alumni Gathering (more info in column to the right). Please be sure to RSVP and complete a short survey to help us in thinking about next steps for engaging our expanding Alumni Network. for easy sharing of the week's activities. Various members of the Baltimore Corps network across the city will open their doors for interactive information sessions and activities related to the work being done throughout Baltimore City. RSVP to any or all at baltimorecorps.org/events. Learn more about GHHI’s comprehensive approach to looking at housing as an integral factor in the health of families and communities. Through engaging conversations and interactive activities with our staff and crew, explore how GHHI is addressing lead paint, asthma, weatherization, and fall prevention needs in Baltimore and beyond. Come learn about efforts in creating a positive culture around democracy for all Baltimoreans with a specific focus on first time voters including returning citizens and youth. Shadow Baltimore Votes members as they run through the first time voter programming. 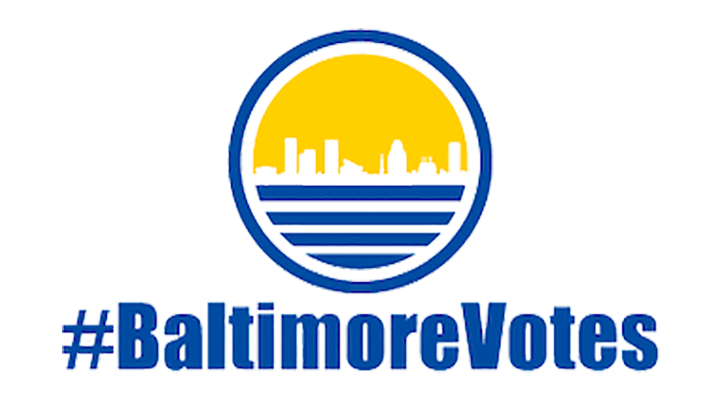 Find out how you can join Baltimore Votes and register voters in your community. Come for a candid discussion on how standardized tests and compliance-­based school cultures deprive students the opportunity to create, discover, and innovate. 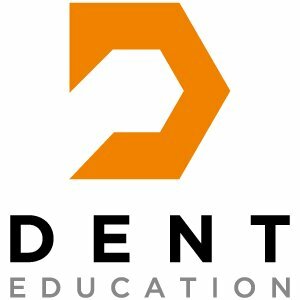 Engage in an hands-on demonstration on the principles of design thinking and review case studies of student success. Learn about best practices for engaging the youth of the Greenmount West neighborhood. Understand how the center is used to connect children, their families, and the greater community. Get a better grasp of the vital Baltimore City partnerships that allow the center to outfit the space and drive programming. 4:00 - 6:00 p.m. | 6:00 - 8:00 p.m.
Come for a roundtable discussion highlighting how community members and community organizations can be in support of black women during the prenatal and postpartum stages of pregnancy and motherhood. 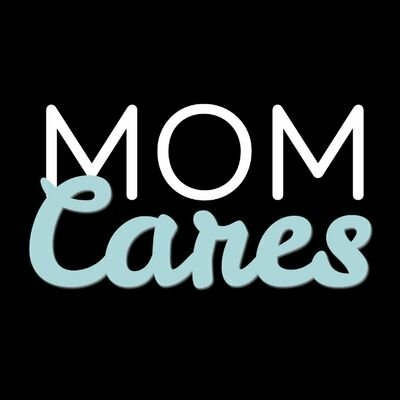 Preview the MOMcares Holistic Care plan and take part in holistic care plan activities including a short breathing exercise and visualization activity. Learn about the history of refugees and immigrants in Baltimore City and why inclusion is essential for empowering America’s newest neighbors. Gain a deeper understanding of how the inclusion business model is used to reduce economic barriers. 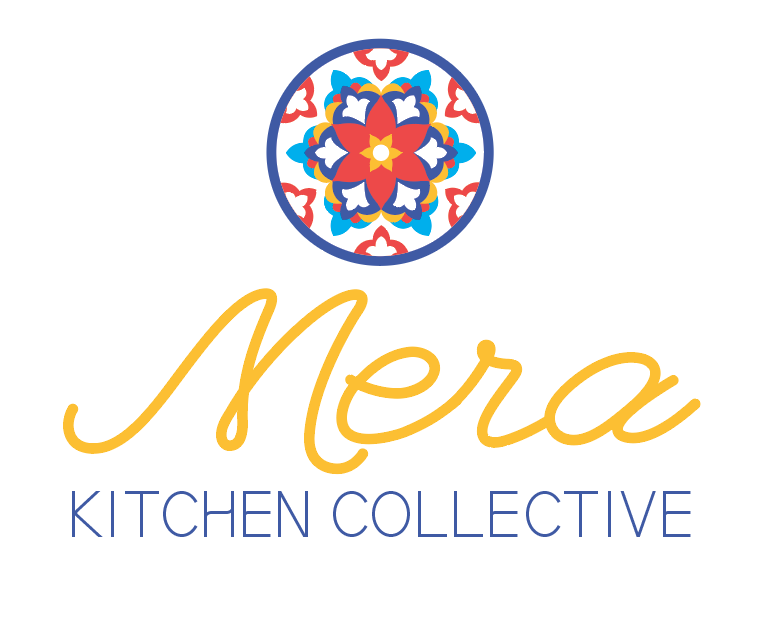 Hear first hand stories and powerful testimonials. 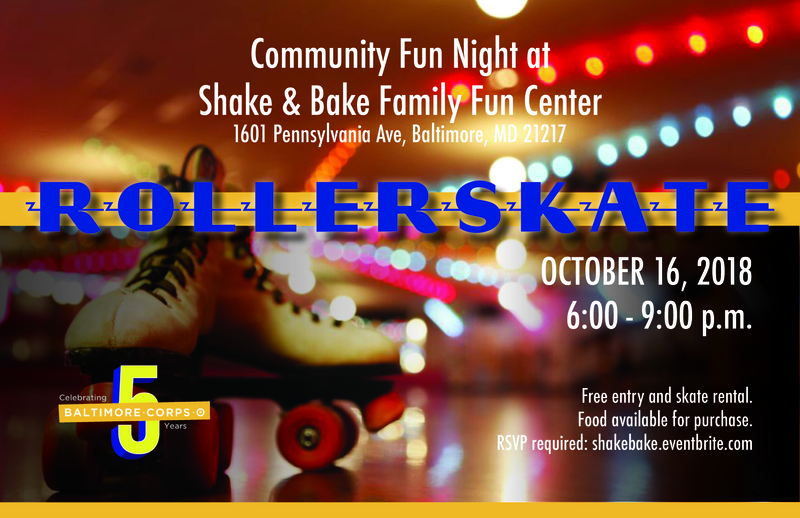 Free entry and skate rental; food available for purchase from vendors including From The Heart Food Truck, Quinn's Ice, and Lemontopia. Need a mask? 2016-17 Elevation Awardee Wendy Camilla Blackwell will be on-hand to help you create your own, OR, contact her (ASAP) at unmaskedfibers@gmail.com. Check out some of her designs on Instagram @unmasked_artlady. Friday, October 26 & Saturday, October 27, 2018 | 8:00 p.m.
A modern-day meditation on work, career, and the American Dream, Big Work’s cast comprises BJHSG members and community volunteers. 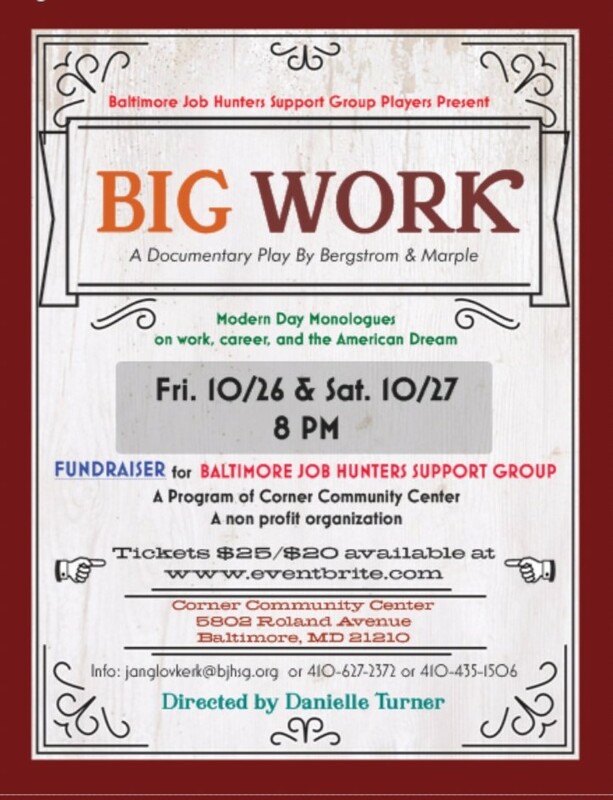 The production is part of BJHSG’s mission to increase awareness of the long-term unemployment issue in the Greater Baltimore area and commemorates the 10th anniversary of the Great Recession’s onset. Playwrights Melissa Bergstrom and Kate Marple interviewed people from around the country and features their verbatim conversations from 19 characters in the script. For the Baltimore performances, the characters will be performed by a diverse company of 12 community volunteers who will take on multiple roles. Several of the cast are members of the BJHSG, some are unemployed or underemployed, others are working or retired. The performances feature a “Third Act” in which the audience can ask questions and meet the cast and BJHSG members. “We hope to start a real community conversation,” says Glover-Kerkvliet.